Waterfront setting with fabulous views across the Waimea inlet to the mountains. Five acres of organic vineyard, orchard and regenerating native bush to explore. 5 minutes to cafes, shops and galleries in Mapua village. 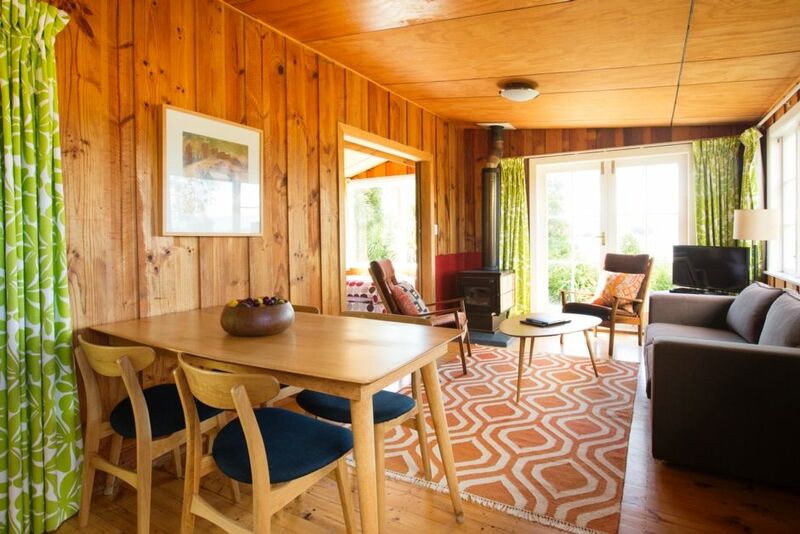 Karaka is a stylishly renovated 1950’s apple pickers’ cottage. A large covered verandah and private garden lead to the estuary shore. We have two paddle boards and kayaks which guests are free to use. The outdoor bath is beautiful in the morning with the sun streaming through the trees, amazing on a clear night looking at the stars. This is a perfect place to come back to after a day exploring the Nelson region. It is also a perfect place to simply enjoy the pleasures of a bach holiday with good books, board games, barbecue, hammock, and endless views to gaze at. Wander around our very special five acres and choose your favourite quiet spot to read or snooze or have a picnic. The well equipped kitchen is great for making the most of the fabulous fresh produce the Nelson region has to offer. We cater to adults and children aged 12 years and older. The property was exactly as advertised. Super cute cabin/summer home with a retro feel. Access to laundry facilities was awesome. The property was super quiet at night and if the sky was clear the stars were amazing. Elspeth has an excellent information binder with suggestions of things to do and restaurants close by....I loved the Apple Shed. It was an excellent place to stay to explore the Nelson and Abel Tasman area. Would highly recommend!! A very restful spot with lovely views. A very restful spot with lovely views. Charming accommodation. Very comfortable, clean and well equipped. A great getaway. Beautiful location with lots to see and do within easy driving distance. The cabin was cozy, comfortable. The views were incrdible at any time of day. Watching the tide go out, the sunrise and the many birds come and go was very relaxing. We were able to explore the area and Able Tasman National Park. If we make it back to NZ, we can only hope to stay here again! A special little house in a truly lovely spot, no glitz, just classy comfort and a spectacular view. A special little house in a truly lovely spot, no glitz, just classy comfort and a spectacular view. Great for the kids to roam around (trees laden with apples when we were there), and nice kayaking on the estuary (although probably not so good for swimming). You won't go wrong here. We had the best week - such a relaxing spot - can't wait to come back.